Chop cabbage and onions and grate carrots. Whisk the vinegar, oil and mustard together with the parsley and pepper. Combine the cabbage, carrot and onion in a large mixing bowl. Stir in the peanuts and capers, then pour the dressing on. 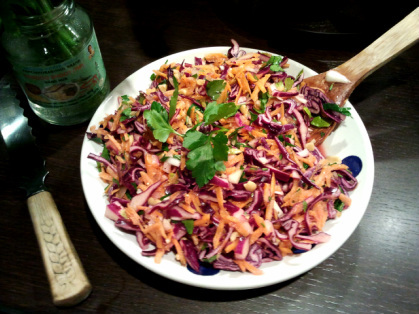 A colourful way of boosting a salad and using up carrots and cabbages... but leave out anything else you don't fancy! See Not-Dairy for details if you prefer a version with mayonnaise. Got some red cabbage left over and not sure what to do with it? Why not make some sauerkraut?